If you’re the owner of a power washing business did you know that there a numerous applications for your equipment, such as sewer drain cleaning, that will increase your company’s revenue stream? As a responsible business owner you should always be on the lookout for ways to increase your revenue. Your power washing equipment was a substantial investment and it only makes sense for you to use it to generate as much income as possible. Why limit yourself to just power washing when you can also use your equipment for sewer drain cleaning, industrial pipe cleaning, hydro drilling, and cable pulling? 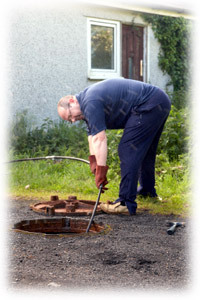 Sewer drain cleaning will require pressures in the range of 1200 to 4000 PSI with high flow rates of up to 3-4 GPM to properly flush away debris. These high thrust capabilities are a good idea if you want to tackle long sections of sewer or drain piping. Choosing the right nozzles and jetter hoses depends on the size and condition of the pipe. Larger size nozzles, such as 3/4", produce high thrust angles that are ideal for pulling jetting hose lines long distances. Smaller nozzles are ideal for cutting roots, often a major culprit in clogging sewer and drain lines. Cleaning industrial piping requires much higher pressures than sewer drain cleaning in order to effectively remove debris that can clog industrial piping. These applications require equipment that is capable of producing up to 20,000 PSI and require specially designed high pressure nozzles to handle the high pressure rates. Hydro drilling is best described as the process of using high-pressure water to blast through soil or rock to create post holes or to create pathways for underground piping or cabling. Smaller nozzles, typically about 1/8” are the best size to use for this application. Also, this application will require special spray patterns using multiple jets that range from 0 to 25 degrees. Ask any data or communication cabling company about what is the most labor intensive part of their jobs and they’ll usually respond with cable pulling. Today, many of these companies are exploring the option of using high pressure water “snakes” to efficiently pull cable through conduits. Using a lightweight, high pressure hose coupled with a maximum thrust nozzle will allow you to complete cable pulls from junction box to junction box in no time at all. The nozzle is equipped with an eye bolt that you can attach a snake line to. Once the hose is retrieved from the conduit, you can use the snake to pull the wire. The use of high pressure power washing systems has expanded too many different fields and applications. This equipment is no longer solely used for cleaning and removing finishes from wood or metal. Now business owners realize the potential of this powerful equipment to be an effective tool for sewer drain cleaning and other drain sewer jetters applications that will increase their company’s profits. And what business owner wouldn’t be happy with that scenario.